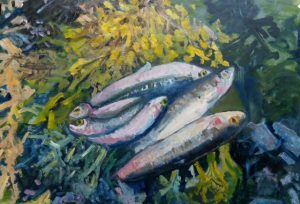 Saddleworth Group of Artists Annual Winter Exhibition 2017 From Saturday 9th December – Sunday 14th January at Saddleworth Museum. Uppermill. Oldham. Well known local artists will again be exhibiting their work. Always a popular show, especially in the run up to Christmas, the exhibition will be comprised of around fifty works, with styles ranging from photo realism to expressionistic. Most paintings will be on sale. The group, founded in 1950 by water colourist Ellis Shaw and friends, is currently comprised of approximately sixty enthusiastic members. Some are full time professionals but all are seriously committed to their work. The SGA is a dynamic organisation, full of ideas to encourage interest and bring art to the public view. The group welcomes applications for membership or offers of new exhibition spaces. So why not call in and take a look at the recently refurbished Saddleworth Museum and possibly find that very special and unique Christmas present amongst the art works on display. Check out our website – www.saddleworthartists.co.uk. Saddleworth Museum, High St, Uppermill, OL36HS Tel. 01457874093.